Before Christmas, Kip highlighted quarterback Chandler Harnish as a possible option for the Seahawks in April’s draft. I hadn’t had any access to Northern Illinois game tape, but having read Kip’s review I made sure to watch last night’s GoDaddy.Com Bowl between the Huskies and Arkansas State. It was an impressive performance from the quarterback and left me wanting to learn more. I’ve included game tape above which highlights every snap he took in a victory over Toledo, while I also referred to this video against Army. There’s an awful lot to like here. Even at the collegiate level his drops backs are crisp and sharp – an underrated feature. It’s not so much the footwork either, which is good, but rather the way he scans the field while stepping back. There were several instances against Arkansas State, Toledo and Army where you can see Harnish looking downfield as he sets, switching from one option to another and making a completion. Although he’s a long way off the kind of technical qualities we see from Matt Barkley, he’s certainly a cut above the majority of college QB’s I’ve watched this year. Take a look at the touchdown pass at 0:50 in the video above. He looks initially to his left but doesn’t like the read, so comes back across to the middle. He rejects that secondary option and comes back to the left, scrambles to extend the play and then draws the defensive back before dumping a perfect pass into the end zone. That’s textbook quarterback play in several ways. One of the other things that really impresses me about Harnish is the way he hangs in the pocket to the last possible second to deliver a throw. He’s not flustered by pressure at all. Look at 2:19 because it happened three times in the Arkansas State game too. Harnish will know the defensive end is approaching, but he doesn’t bail on the play call. He’s athletic, so he could’ve scrambled and lost the passing window. There’s perhaps an even better example at 4:23 where he takes a huge hit but still finds his receiver in the back of the end zone for a touchdown. It’s a difficult throw into a tight window – a NFL throw. This is almost an unteachable skill for quarterbacks. His accuracy overall was very good – in the two full games I’ve watched in the last 24 hours I barely saw one throw he’d like to have back. Ball placement is excellent. Unlike a prospect like Ryan Lindley – who has a lot of similar qualities – there weren’t any plays where the quarterback has risked a bad turnover or just failed to execute. He has a low number of turnovers for his career (only five interceptions in the 2011 regular season) and the one pick he had against Arkansas State was all on the receiver who allowed the ball to be taken out of his hands. Look at the play at 5:20 where he steps up into the pocket, has a little pump and hits a receiver despite excellent coverage and three defensive backs in the zone. Again, it’s a NFL throw. The pass to win the game at 6:39 is equally impressive. Harnish is a fluid and effective runner with the football. He looks a real threat on run-option and while that won’t be a big part of his game at the next level, he has above average running ability for the position and will be able to make first downs and break off gains. Not surprisingly it also translates to an ability to extend plays, run bootlegs and throw effectively on the run on developing routes – all key within the Seahawks offense. A good example of his running ability comes at 4:09 but there are a number of examples in the video above. He understands touch and knows when to take pace off the throw. Harnish has a decent arm but he doesn’t pass at one speed or rely on arm strength to make difficult throws. You can see at 0:35 his poise on fourth down to take the snap, set and deliver a nice controlled pass for the first down completion. Technically it’s an easy pass, but the circumstances cloud things slightly and he kept his cool in the pocket to deliver the correct throw. I also like the way he throws to the touchline and particularly his work on the inside slant. The play at 1:45 is a good example – nice pop on the pass, good delivery and allows the receiver to make a play. On the downside, his height concerns me and he’s listed at – and looks – 6-1.5. He currently takes the snap almost in the crouching position and in some of the All-22 replays he’s clearly shorter than the lineman making it difficult to scan the field. Against Arkansas State I saw on more than one occassion a pass that was a little flat where he just didn’t have the angle to throw over the linebacker and one instance almost led to a turnover. At the same time, I haven’t seen a lot of tipped passes and his release point is high rather than a slingy action. But the height is a shame, because it’s really the only major knock and otherwise he’d have legitimate early round potential. This could put teams off, but it’s not a deal breaker. Although he has decent arm strength, it could be even better if he learns to transfer the weight onto his front foot throwing downfield. You can see at 2:07 how he leans back and delivers the ball off the back-foot and although he makes the completion, he won’t have that kind of window in the NFL. Of course, the receiver was so open he may just have been ‘playing it safe’. At the next level he needs to force that play a little more and step into the throw, getting it out in front of the receiver and giving him a chance to get the ball in stride. There are also some concerns about the level of competition he’s faced in the MAC because he had a marginal impact against Wisconsin in a 49-7 defeat (14-24 passing, 164 yards and no scores). The tape above highlights his best performance of the season and really to make a proper judgement you’d have to compare it to the Wisconsin game to make a proper judgement. Based on the evidence I’ve seen so far though, he’s a definite sleeper for the Seahawks and could go earlier than a lot of people expect. I haven’t seen any of his games, but as an NIU alum myself, I think it would be cool to have a Husky on the Seahawks. I know every shortie gets a Drew Brees comparison, but he looks more like Drew than any QB I have seen in a while. Deep dropbacks to a throwing lane, sudden movement when scrambling or even just sudden stepping into the pocket, and using open areas of the field very well, in addition to putting the ball high in the endzone. Harnish is a QB I would be excited about, despite his shortcomings. I’m impressed…I also like his intelligence and demeanor in the postgame interviews (on the other youtube videos that come up). He’s six foot one and a half. Also agree on the interviews, was tempted to link to one. He’s completely switched on. Harnish is 6’2 according to Kip’s article but it is probably closer to 6’1 and a half. He looks like a shorter Kapernick to me. I’d be interested in how Harnish compares to Kap in terms of being a passer (they look like comparable runners). Just from the eye test Harnish seems better in that area to me but doesn’t have the size of Kapernick, so he will probably be a mid-late round pick. Wow! I agree with you Rob this kid looks impressive. About his size, I don’t think he’s any smaller than RG3. His footwork is alot better and it looks like the basics are all there (quick release, good decisions, extends plays, mobile, and sees the whole feild, with 2nd and 3rd options). I would still question his competion level, but if he’s got the “stuff” to win and a great O-line his performance at the Pro level will come up. Why didn’t we hear about this kid before? I guess that’s a good thing as he may slip under the radar to us if Pete and john know about him? What round might he go in? While not the physical force of nature that Big Ben is, Harnish plays against the same level of competition that Roethlisberger played against (MAC), and I’d say Ben has done all right in the NFL. 6015 sounds right. Draft sites listed him at 6’2″, but keep in mind that Jake Locker was officially 6025 but was listed as 6’3″ most places. Level of competition always matters, but for whatever reason it seems to matter less for playmaker positions like WR and QB. If you have instincts, athleticism, size, and playmaking ability, that usually translates. So much of what makes a QB great is simply talent, and if playing in the MAC made Harnish’s talent easier to see, that doesn’t diminish the fact that the talent is there. Also, I don’t think it means anything that Harnish was pedestrian against Wisconsin. Harnish would never face a talent discrepancy in the pros even remotely close to the gap in talent between NIU and Wisconsin. That’s a very good point, Kip. I saw a couple things that really stood out to me. First, he has to be tough as hell because he ran it a lot and took a lot of abuse. I like that he’s so tough but I question why he ran so much and took so many hits instead of sliding. Maybe it’s because I don’t watch college ball much and have an amateur eye for this stuff. The second thing I noticed was the tendency to float balls to receivers a la Hasselbeck. I saw several instances where receivers actually had to slow down, one even had to stop, in order to wait for the ball to get to them. In the NFL this is not a good thing and can lead to interceptions, broken receivers, and missed points. I am very interested to hear your thoughts on this. Thanks! So would he figure to be taken around round 4 or 5 at this point? I know his stock can rise\fall after the combine and such but haven’t really heard his name much thus far. Nick – That’s a fair point on the floated passes, but I think it’s fair to say he does have an arm and most of the issues are technical. He leans back far too much when he sets on the deep ball and if he translates his weight onto the front foot he should be able to drill those passes a little flatter and with more velocity. Gump – I think that’s where his stock is now, but he could go earlier. There’s a lot of pro-potential there. There’s perhaps an even better example at 4:23 where he takes a huge hit but still finds his receiver in the back of the end zone for a touchdown. It’s a difficult throw into a tight window – a NFL throw. This is almost an unteachable skill for quarterbacks. But will this get him killed early in his career ? There is such a fine line on when to bail out, and knowing when to avoid the big hit also falls into the “unteachable skillz” catagory. I am loving the write-ups on all these guys Rob, it just keeps the pre-draft buzz rolling along sweetly while the other teams are playing post-season. I was actually not bummed with the final loss at AZ, for two reasons. 2) obviously, picking 11/12 is way better than 18. There are SO MANY directions we could go at 11/12, from trading the farm to get our QB, to really, any other position of BPA. Depending on who takes who, there really isn’t a solid map of who is going when which is making this years draft so interesting. They could even possibly trade down, given other teams needs. Anyways, keep up the killer work Rob. It is appreciated more that you even know. Really like Harnish as a developmental QB. I think he has better pure tools then players that may go earlier than him (Kirk Cousins, K. Moore, A. Davis). Even if the Seahawks take a QB early, I would like to see them grab Harnish if he’s there in the second half of the draft. Looking forward to more articles when you get more tape, Rob. 2) I couldn’t agree more with Scott comparing Harnish to Brees. This kid looks more like Brees than Keenum and More, and he’s a little bigger than any of the aforementioned. Most people forget that at Purdue, Brees scrambled quite a bit, and even ran the option – he’s a lot better athlete than he gets credit for. And like Rob said, Harnish prob won’t do much planned running in the NFL, a la Tebow. This could be a huge senior bowl for the Seahawks coming up. Lets just say, theoretically, that Austin Davis and Chandler Harnish are two of the guys Seattle has their eye on, hoping to draft them in the mid-late rounds. The only thing Davis and Harnish are missing is a ticket on the crazy hype train, and a stellar performance in the senior bowl would do just that. If these guys blow up the senior bowl and cause the draft community to take notice of the college careers these guys have put up, there is a very real chance they could go before our 2nd pick. If you’re looking for more video on Harnish, here are three videos that’ll give you pretty much anything you could ask for. Agreed, Kip. Christian Ponder, after a bad senior campaign with FSU, was the talk of the Senior Bowl practices then blew away everyone during the game. I was curious to see where Harnish would be playing in post-season all star games, so i asked him on twitter(not a stalker! ), and he said he accepted an invitation to the East-West Shrine Bowl which i believe is the 21st. Interesting, that’ll be one to keep an eye on. I think it would be cool if you looked at all the back up quarterbacks in the league for who we could possibly pick up Rob. Its basically all the front office has gone for, not that 2 years is much to create an MO. I have a feeling though that Brady Quinn has a chance to be a lot like Brees. He was crappy when starting really young but he was basically playing over protective, like the coach scared him out of trying for any big plays, or more like making any mistakes. But he’s always had mechanics that I’ve loved, just needed better decision making and actually doing it. Also, I don’t know much about McCarron or whatever Alabama’s QBs name is but he was pretty impressive against LSU today and showed all the attributes Carroll likes. I think Alabama had the best offense in the SEC and this is with no J. Jones and they didn’t run EVERY down. PS i think every year they’re should be a “SLEEPERS IN SEATTLE” segment. Haha thats funny to me. For God’s sake, that was one of the most deliberate College QBs I have seen in a LONG time. Stipulating that I don’t know anything– this kid just looks like he’s in total command. I mean, seriously. He just looks like he has an amazing QB “vocabulary”. One little detail I loved: the convincing ball fake at 1:51. He holds it that extra beat that apparently makes a lot of difference. Arizona drafted one QB in the 2010 draft in Skelton in the 5th round and ended up picking up another UDFA QB in Max Hall. Greenbay did something similar with Brian Brohm in the 2nd and Flynn in the 7th. Do you see the Hawks going after two QBs that they think highly of and see who fits best? Everything knows finding a starting QB after the 1st round is hard enough but if the hawks take two in later rounds such as A. Davis and Harnish then hopefully one would work out while giving the 12th man a field day guessing which one will become the true QBOTF. It did seem to work well for both Greenbay and Arizona. Skelton finished out the season with the Cardinals playing fairly well (with Hall even starting a few games in 2010) and Flynn eventually beat out Brohm and has become the talk of the town and a potential FA target of many teams needing a starting QB. 1) While he does through a good deep ball, I won’t say it’s great. It’s a little floaty at times, and I have to say, that WR Palmer he throws to a lot makes some great catches on some above average throws. 2) I’m a little worried that he’s a little bit too gunslingy. I think I counted about 5-6 throws that would’ve been picked off by a NFL cornerback (except Kelly Jennings…heeyyyoo), and a lot of the throws in the highlights were to absolutely wide open WR’s. Better competition might make him not look so hot anymore. 3) One thing that I was reading in between the lines was the scores in between highlights that concerns me. I know there’s a lot of different factors that go into it, but there were a lot of times that NIU completed a long pass within in the redzone, and the next highlight shows that they only got a fieldgoal out of the possession. I know it’s reading a lot into something I don’t have full context for, but found it interesting nevertheless, especially about a prospect not a lot of us know very well. Aaron – that’s how I’d grade the top four, but probably with Harnish at #3 if future tape study matches what I’ve seen against Toledo, Arkansas State and Army. I’m not sure about Tannehill and whether he’d be at #5, I’ve really not been impressed with him this year. Brik – it’s something I may look into, although really the Seahawks need to get their own guy rather than looking at backups. I sincerely hope that’s how they’re approaching it anyway. Al – what do you mean by ‘deliberate’? Cliff – If they don’t have the opportunity to draft a quarterback in round one, that is exactly what I would do. Bring in the two guys using later picks and let them compete. If you’re going to muddle around without spending a first rounder, you can’t expect to hit gold with the first UDFA you bring in. Let Portis, Harnish, Davis or whoever fight it out and maybe, just maybe, you find the answer. It’s really no different to the fact Seattle has drafted several defensive backs, some working out and others not so much so far. And while I will always champion the need to go big at the QB spot and get that top-end talent in round one, if that’s not possible – you have to look at multiple options. I’d have no issue spending a 3rd rounder on Harnish if that’s his range (he could go earlier) and then a 4th or 5th on Davis. Considering you’ve spent the first two picks elsewhere to fill other needs, this makes absolute sense. I like the idea of taking two late round QBs and letting them fight with Portus for the backup spot. Too many critics are busy picking at flaws like height that have nothing to do with winning football games. And given a great team and a good QB, even Yates and Flynn can win. You just have to weed through your second and third string guys till you get the right ones. This make take two years of drafting and tryouts. Exactly. The Hawks, if they do not trade up and grab their QB, they should be drafting two QB’s in this draft, and depening how things play out draft a QB in next years draft, etc. This position has been ignored for so long it blows my mind why there have not been more picks targeting this position. That being said, it might be good to grab a big talent at WR in the first (or trade down a few slots-grab the WR), and the QB in the 2nd/3rd. Also, the Hawks have 12 or so players that will need to be resigned, with obviously Marshawn as number one priority and Red Bryant number 2. Red wants to stay here, but Marshawn has not expressed a feeling either way, at least from what I have read/listend to. I did catch Forsett on an interview talking about his friend Lynch and mentioned something to the manner that Lynch already got a big pay day and would like to stay in Seattle. I think that he will have to be given a competitive deal or he will be wooed elsewhere. Carlson is probably gone. I just have this feeling that with Lynch’s year he will end up going to another team, unless he is franchised. So, should the Hawks trade up for RGIII or draft their guy in the later rounds? I keep thinking that Portis has something that Pete isn’t letting on about… Perhaps some mad skillz, but maybe not the brightest bulb? Man just the thought of having more than 1 quarterback on the roster that has even the slightest bit of unexplored upside seems like christmas com early. Also I know it’s not on topic, but what are your thoughts on Melvin Ingram as a potential OLB/DE pass rush specialist for us? Having a respectable 10 sack season in the SEC seems like it deserves some consideration. My only complaint about Harnish is that he does stare down WRs occasionally (which is probably what Al meant by “deliberate”). Making one read is fine, but don’t stare at that one read for 3 seconds before throwing the ball. Given the fact that he’s shown himself to be capable of making multiple reads and is good at quick decisions, I think he could be coached out of this habit in little time. He also scans one side of the field a bit more than I’d like. Again, he’s shown the ability to turn his head and scan the whole field. This is something we saw improvement with in T-Jack this year, so I’m pretty confident this coaching staff could improve Harnish in this area as well. Matt – Ingram is a really fun player to watch, but he’s a tweener. I’m not sure how Seattle would use him or if his skills translate to the NFL. It has to limit his stock. Sorry Rob. I would define deliberate in a similar fashion to how Shams describes his “total command”. In another way, he seems quite confident in his throws (maybe sometimes too confident as Randy brings up a good point about his “gunslingy”-ness). And what Kip said too (sorry for the extra post!). 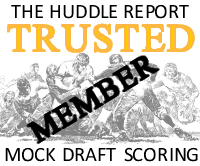 Hi Rob, I have recently come across your site, I love the site, and detailed scouting coverage! I have watched all of 3 games from Harnish, watching every qb play in 2011. I do not believe Harnish will be successful at the next level. On nearly every play he stares down the receivers. His footwork would need alot of work. He does not lead receivers, often they have to slow down or stop. Arm is mediocre, not sure he can throw all NFL throws, with many floating passes. Amazingly many are completed because of the level of competition, would get eaten by any decent safety/db. Running is decent at this level, but well below average in NFL level. He does a great job with pressure in his face. Looks to me like his highest ceiling would not exceed Colt McCoy’s season. I like McCoy at Texas but dont think he is NFL starter material. Hi Derian, thanks for the kind words about the blog and I hope you’ll keep visiting. Interesting thoughts on Harnish. Overall I think he’s a vastly superior passer than Colt McCoy, but then I wasn’t a big fan of McCoy and gave him a R6-7 grade. I think Harnish has something to offer a franchise and could make improvements with pro-coaching, but I’ll take on board the points you make here.